Guess what? I have great news for you! If you missed taking part in our last Facebook quiz and $100 Amazon gift card giveaway entitled “Are You a Patient Revenue Cycle Expert?” you’re in luck, because we are publishing a new quiz “Healthcare Payment Regulatory Compliance: Are You Ready?” based on topics covered in our recent webinar. Didn’t catch the webinar? No problem! You can view the webinar,“Preparing for 2019 and Beyond: How to Navigate State and Federal Revenue Cycle Regulatory Legislation” on our website under “Resources/Webinars” or take a chance and test your existing knowledge of healthcare payment regulatory compliance. For example, are you familiar with the regulations that govern the collection of patient payments? Are you a whiz at all the acronyms associated with legal contact of patients such as CAN SPAM or TCPA? 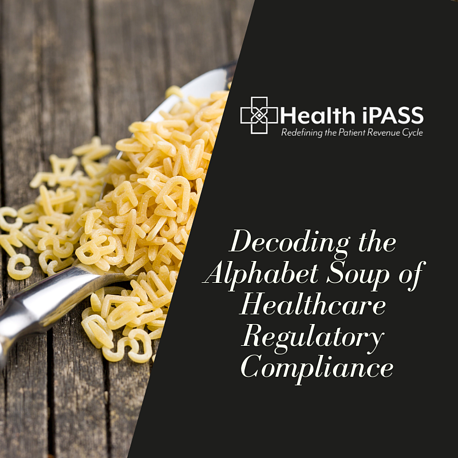 I'll tell you what, these regulations have more letters than alphabet soup!